An All-American and considered the best college defensive line prospect available, even if comparatively unknown to most fans, “Mean Joe” was taken by the Steelers in the first round of the 1969 NFL draft (fourth overall). With his speed as well as strength, he quickly established himself as an outstanding pass rusher from the interior of the line and was the Associated Press Defensive Rookie of the Year. Greene followed up with Pro Bowl years in 1970 and ’71. Steelers went 11-3 to finish first in the AFC Central while leading the NFL in takeaways (48) and ranking a close second in fewest points allowed (175). Won AFC Divisional playoff over Oakland Raiders (13-7). Lost AFC Championship to Miami Dolphins (21-17). 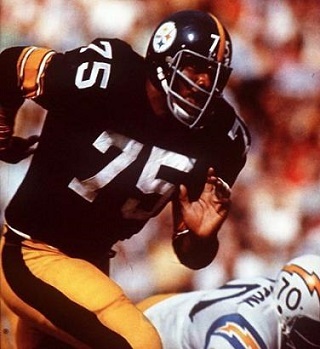 Greene became the cornerstone of an outstanding defense that was one of the highest-ranked in the NFL over the remainder of the decade and the Steelers won four NFL titles. “Mean Joe” was a consensus first-team All-NFL choice in each of the next two seasons and his string of Pro Bowl selections reached eight straight. He was again the AP Defensive Player of the Year in 1974 as the Steelers won their first of back-to-back NFL Championships. Fast, strong, and agile, he had the ability to dominate games and provided outstanding emotional leadership. He played a total of 13 years, all with Pittsburgh, and was a consensus first-team All-NFL selection five times, received at least some All-NFL or All-AFC recognition in four other seasons, and was named to the Pro Bowl on a total of 10 occasions. Greene was inducted into the Pro Football Hall of Fame, Class of 1987.